Whether it’s for lightweight layering or soft sleepwear in summer, you can’t go wrong with our collection of kids vests and camisoles. Crafted from comfortable cotton fabrics with soft and stretchable fibres, your little one will love their feel-good fits. Choose from plain and patterned tank tops that your boys will love and delicate lace camisoles designed for the girls. For added support that doesn’t compromise on comfort, take advantage of our collection of crop-tops and bralettes for girls. Seamless crop-tops are perfect for providing support without the weight of wire whereas pull-on designs make difficult changes a problem of the past. Make use of neutral colours and monochrome tones for everyday styles that can be mixed and matched with ease, reserving bright prints and patterns for bolder underwear attire. When it comes to comfortable clothing that combats cool weather with ease, rely on our range of kids thermal underwear. Made from merino wool with warmth in mind, thermal layers are perfect for providing added coverage and comfort. Utilise tank tops and t-shirts for lightweight base layers, reserving long-sleeve designs for a snug and secure fit. For outside activities that require high-intensity exercise, take advantage of our selection of performance underwear for boys. Fitted out in durable fabrics that retain their shape well, our performance underwear is ideal for activity and harsh climates. Elasticated waistbands prevent them from moving out of place while mesh panel features foster breathability. For light and breathable underwear that will have them set for sleeping in summer, turn to our broad range of boxer shorts for kids. Fitted out in sleek satin fabrics that are comfortable and cool, boxer shorts are the perfect underwear to combat the heat and humidity of summer. Rely on elasticated waistbands for a soft yet secure fit and bright and colourful designs that turn bedtime routine from burdensome into a breeze. When it comes to kids underwear that’s as comfortable as it is cute, take advantage of our wide range of boys and girls underwear. From briefs and trunks for the boys to bikini, boyleg and shortie styles for the girls, we’ve everything you need to keep the kids feeling stylish and supported. Comfortable cotton fabrics lend to keeping things lightweight and breathable while stretchable fibres foster a soft and flexible fit. Keep their feet comfortable and secure with a wide selection of both boys and girlssocks. When it comes to versatile style that can be worn to school and on the weekend, nothing competes with a pair of plain socks. Crafted from comfortable cotton fabrics that are lightweight and breathable, their feet will keep fresh and cool throughout the day. 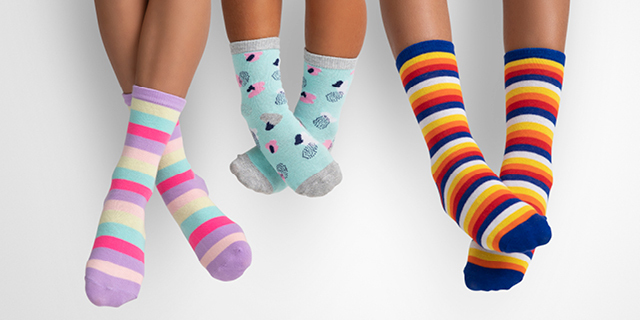 Utilise crew socks in colourful prints and patterns for everyday essentials with a fun and fashionable flair, turning to simple sports socks in neutral colours and tones for added support in exercise and sport. Soft cushioning lends to an all-round comfortable fit whereas reinforced heel and toe features reduce impact on their feet. Best&Less is host to an assortment of favourite kids wear brands including Bonds, Elite Action Sports, Mango, Tradie, Underworks and more. For a wide collection of kids underwear and socks spanning from girls bras and underwear to boys socks and boxers, shop online with Best&Less Australia.